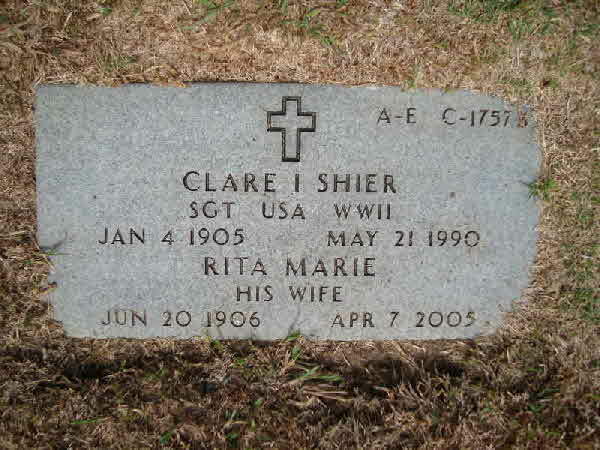 Burial* She was buried in Port Crane Cemetery, Port Crane, Broome County, New York, United States. 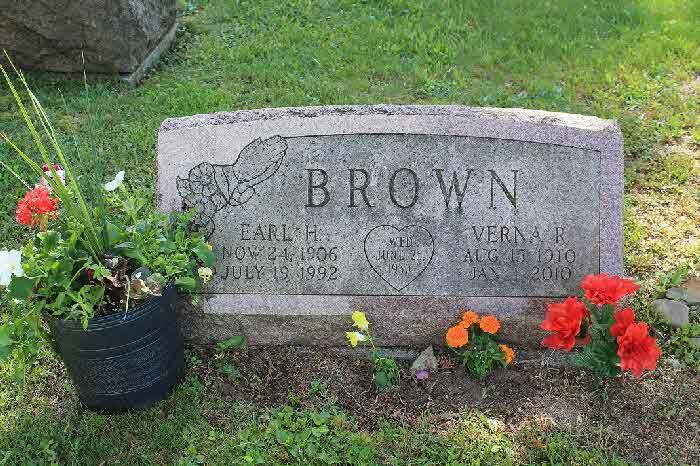 Death* Verna Retta Eliza Doupe died on 1 January 2010 in Cincinnatus, Cortland County, New York, United States, at age 99; Verna R. Brown, 99, of Cincinnatus, NY, passed away on Friday, January 1, 2010, at the home of her daughter in Cincinnatus. 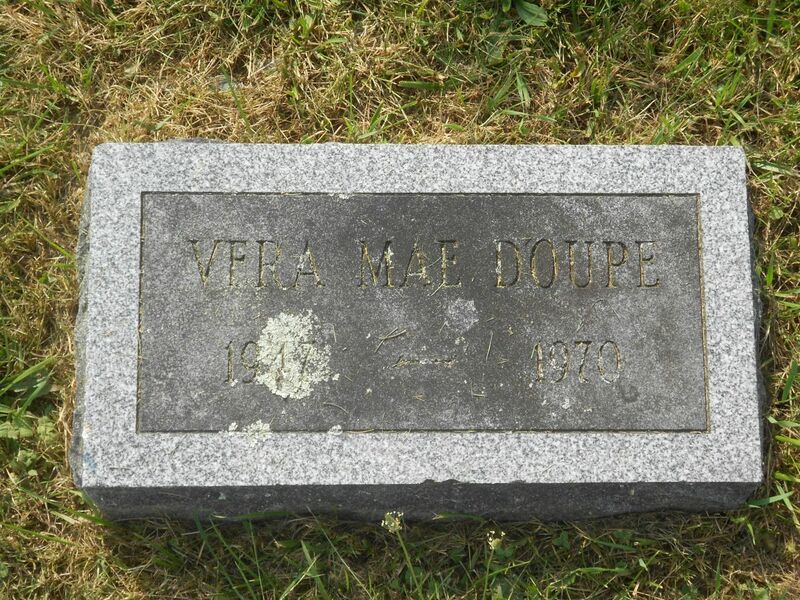 Burial* She was buried in Pitcher Congregational Church Cemetery, Cortland, Cortland County, New York, United States. 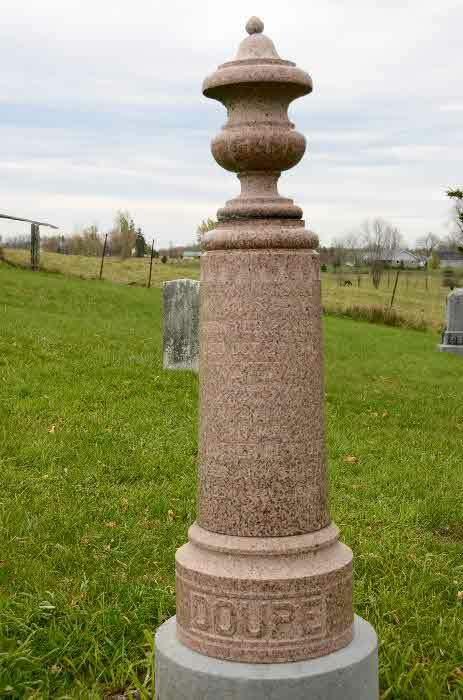 Burial* He was buried in Exeter Cemetery, Hay Twp., Huron County, Ontario, Canada. 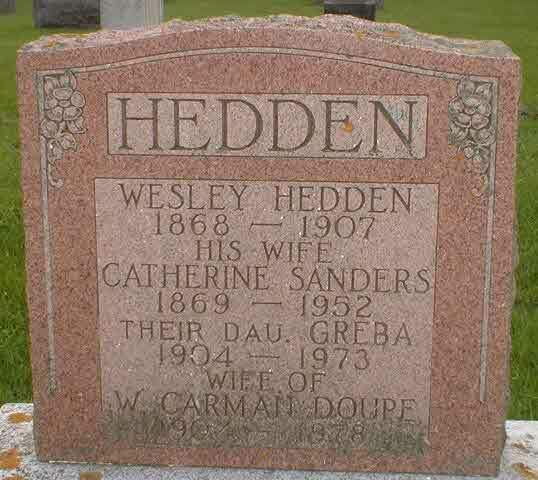 Burial* He was buried in Centreville United Church Cemetery, Camden Twp., Lennox and Addington County, Ontario, Canada. 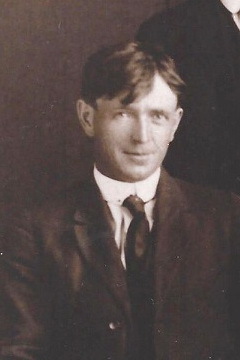 Marriage* William GEORGE Doupe married Mary Jane Heatherington, daughter of Richard Heatherington and Allie Benedict, on 16 May 1907 in New Liskeard, District of Nipissing (Now District of Temiskaming), Ontario, Canada. 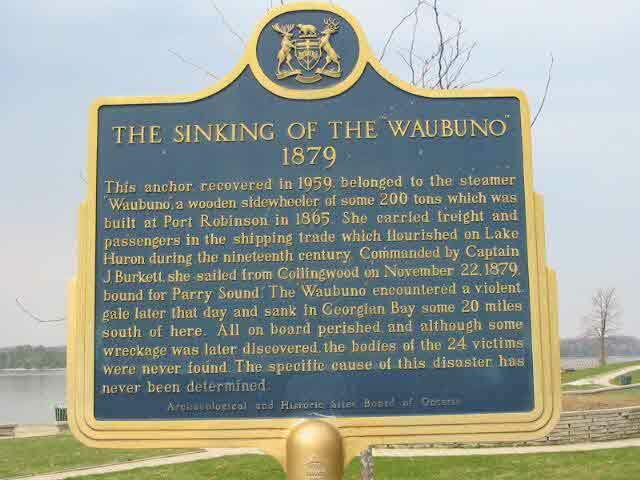 Death* Dr. William H. Doupe died on 22 November 1879 in On Georgian Bay from the sinking of the Side-Wheel Steamer, Waubuno, Ontario, Canada. 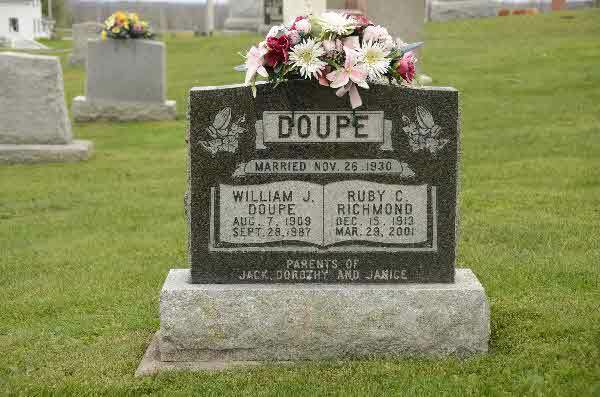 Address* William JAMES Doupe lived at Reidville Cemetery, Camden Twp., Lennox and Addington County, Ontario, Canada. 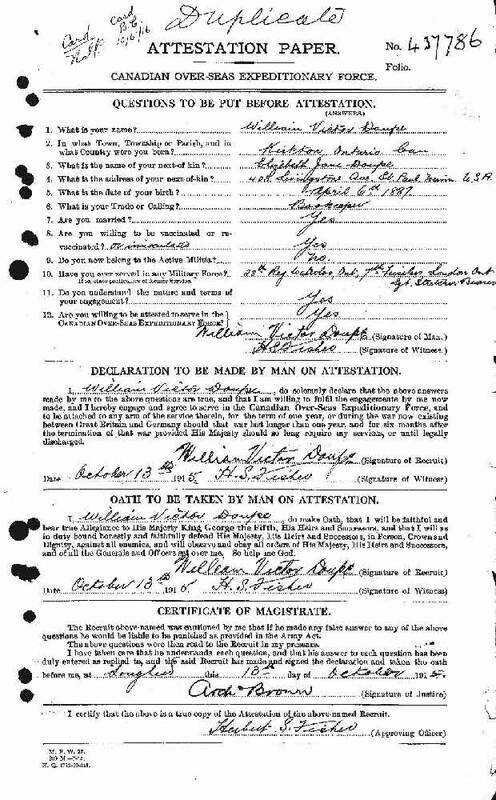 Milit-Beg* William Julius VICTOR Doupe began military service on 13 October 1915. 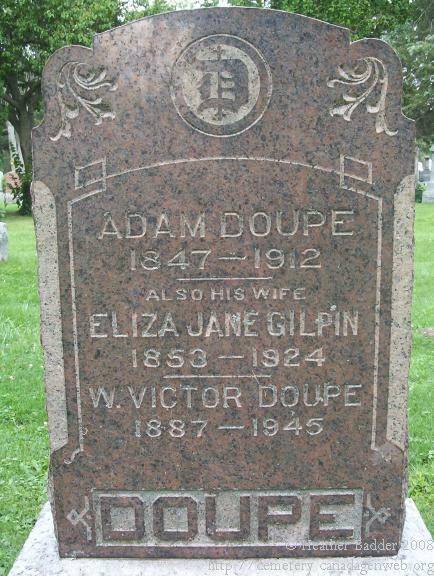 Death* William Permineo Doupe died on 30 January 1882 in Egremont Twp, Grey County, Ontario, Canada. 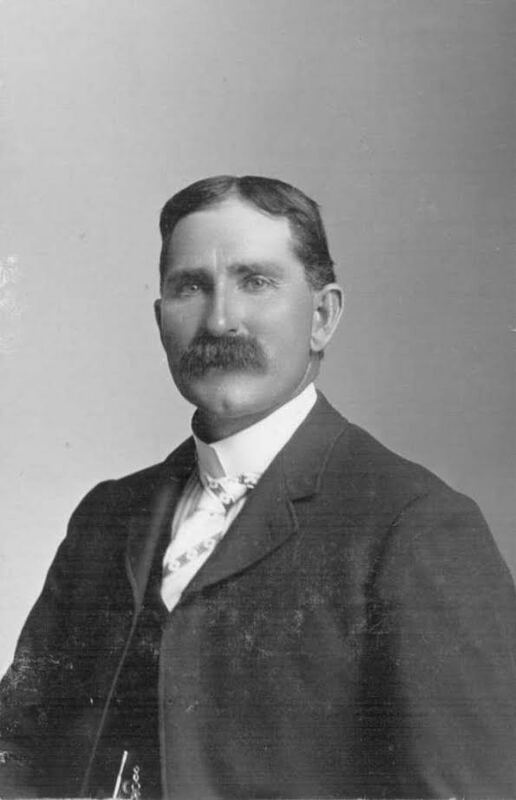 Marriage* William SYDNEY Doupe married Susan Roselpha Crandal, daughter of Amos Crandal and Mary Crandal, on 24 March 1875. 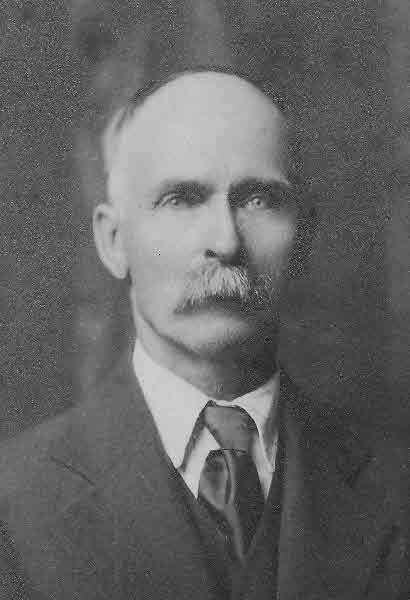 Death* He died on 14 August 1914 in Harley Twp., District of Timiskaming, Ontario, Canada, at age 62. Death* Winnifred ANN Doupe died on 25 January 2015 at age 78; It is with great sadness that we announce the passing of Winnifred Ann Cookson. Ann peacefully departed this world on January 25, 2015 at 11 p.m. with family members at her side. 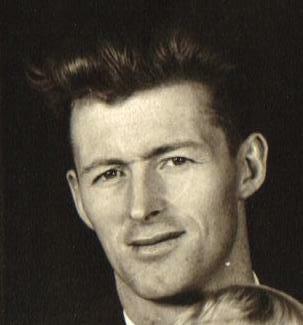 Mom was born in Wetaskiwin to Winnifred & Norman Doupe on November 2, 1936. Ann is lovingly survived by her husband of 58 years, Jack and her 4 children; Bruce & Hania and children Kasia & John of North Vancover; John of Lacombe and daughters Mandy & Jasmin of Calgary; Rob & Shirley (Mitchell) of Zurich, Switzerland; and Sally & Ken Weenink of Lacombe and children Matt of Calgary, Chelsea of Red Deer and Jill of Edmonton. 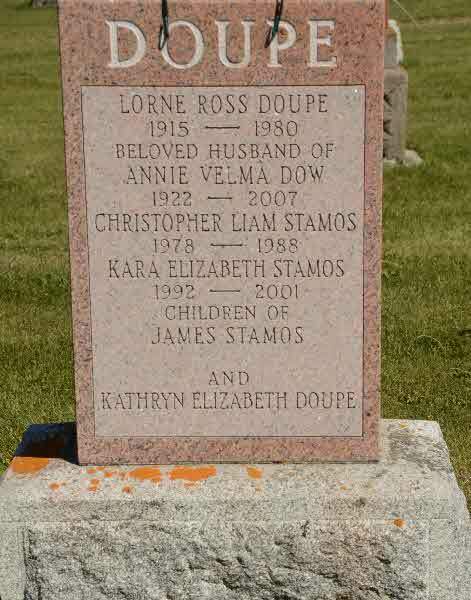 She is also survived by her brother, Rod Doupe and family of Wetaskiwin and sister, Lorna McTavish and family of Red Deer, brother in-law, Ken & Betty Cookson of Lacombe and sister in-law, Margaret Fox of Vancouver. 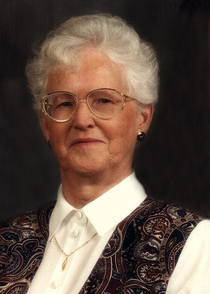 Ann was the bedrock that kept the family farm together and functioning while her husband Jack was away for the years that he was a member of the Alberta Legislature in the 1970’s. 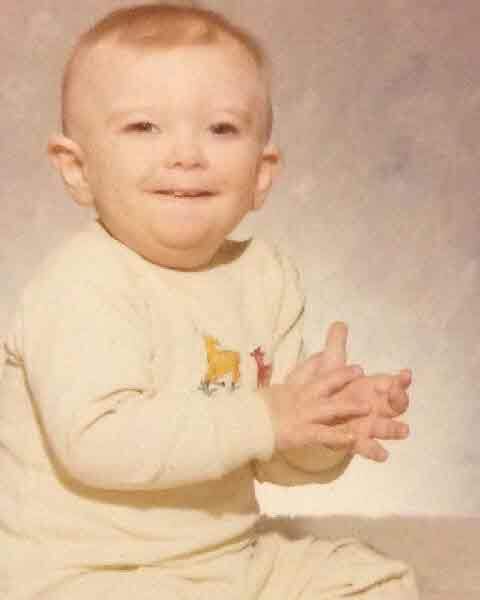 Mom was caring and loving; had a good sense of humour and a feisty spirit. She was not one to complain even though she suffered in pain from Rheumatoid Arthritis during the second half of her life. 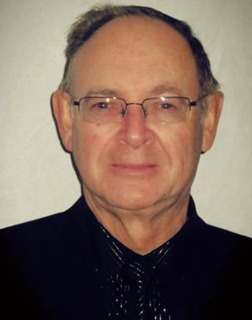 For the care, love and patience that was extended to Ann during her last two years the family would like to extend its sincere thanks and appreciation to Dr. Matt Unger and to all the incredible staff at the Lacombe Hospital Long Term Care. A celebration of Ann’s life will be held on Saturday January 31, 2015 at the St. Andrews United Church in Lacombe , 5226-51 Avenue at 2:00 PM with a time of fellowship and remembrance to follow in the adjoining hall. 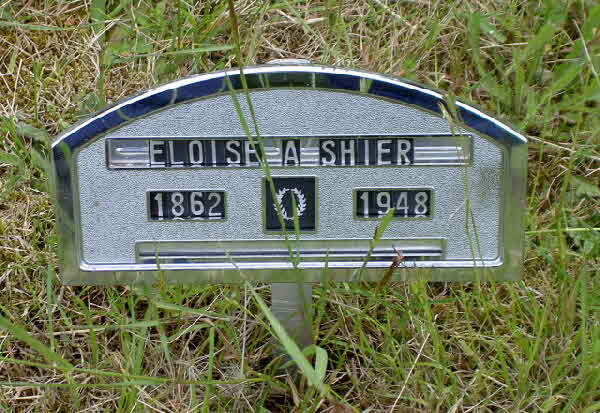 Burial* She was buried in Fairview Cemetery, Gates, Oregon, United States. 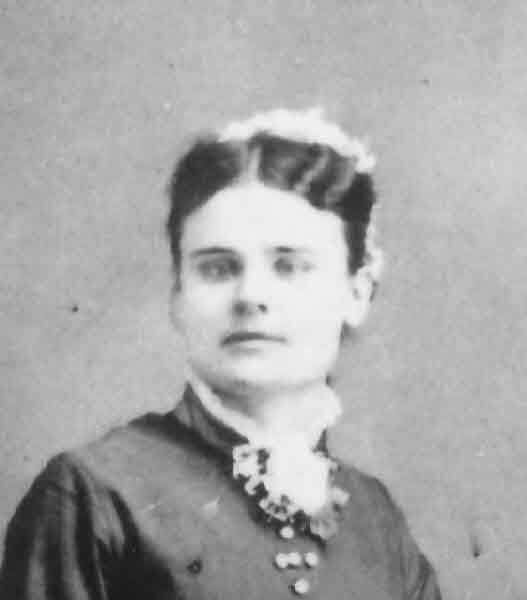 (Witness) Census Mary Drinlcavy appeared on the census of 1870 in the household of Nicholas Shire in Braceville Twp., Grundy County, Illinois, United States. 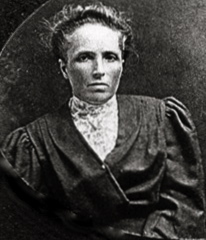 (Witness) Census Mary Drinlcavy appeared on the census of 12 June 1880 in the household of Nicholas Shire in Braceville Twp., Grundy County, Illinois, United States. 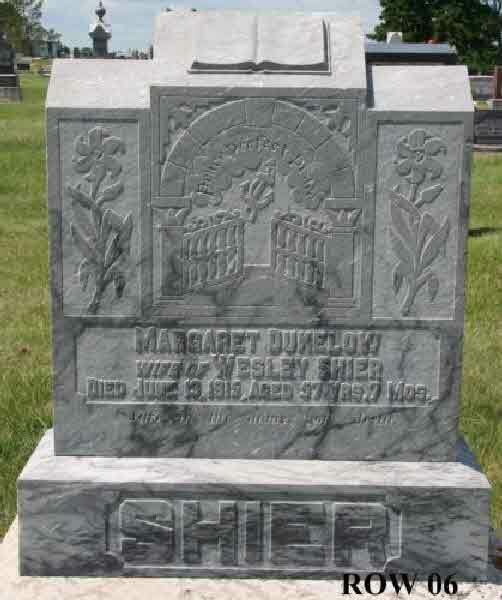 [S22] Unknown compiler address, Saskatchewan Vital Statistics, unknown repository, unknown repository address, Death Registration for Margaret Shier #1865. 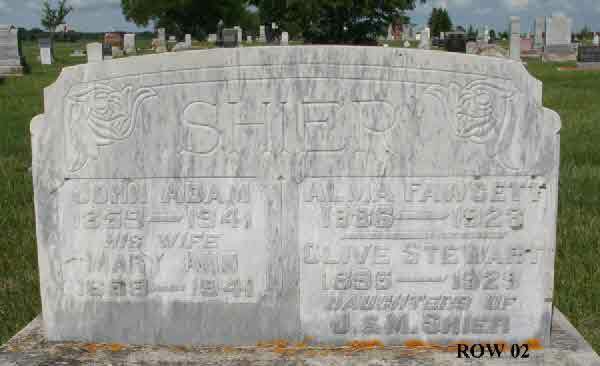 (Witness) Fact 1 Mary Ann Dukelow witnessed the Fact 1 of John Adam Shier; Photo of John Adam Shier and his wife Mary Ann Dukelow. [S26] Unknown record type: unknown subject, by unknown photographer; unknown series; unknown repository, unknown repository address. 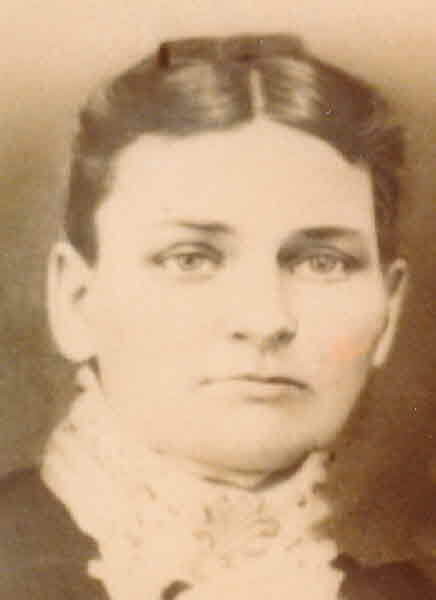 Online unknown url; unknown file name, Death Records for Mary A. Nelson. 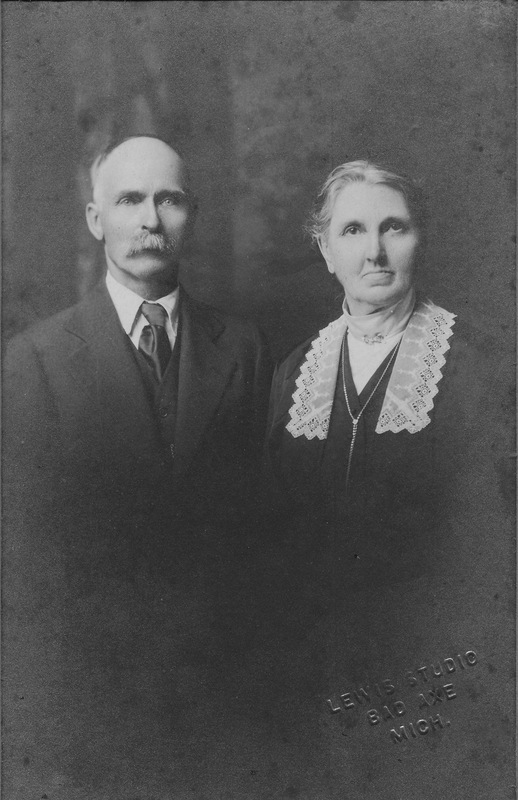 Fact 1* Photo of Richard Dukelow and Emma Shier-Dukelow.